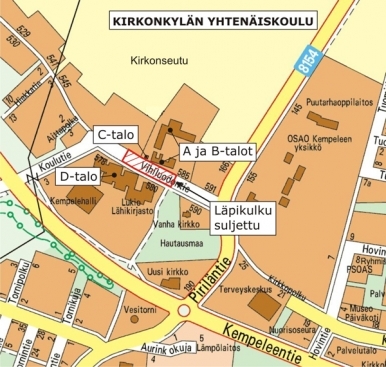 Kirkonkylän yhtenäiskoulu, or Kirkonkylä Comprehensive School, is a non-streaming school with both primary (Years 1-6) and secondary classes (Years 7-9). In 2015-2016, there are 940 students and 96 members of staff, excluding four pre-school classes and their staff. Mr Eero Siika-aho and Mr Jukka Ojala are the headmasters, assisted by deputy headmasters Mr Janne Törmänen and Ms Anu Veteläinen. Since 2002, the school has been part of the Unesco ASPnet programme and worked towards promoting peace and international understanding. Moreover, global issues are an overarching theme in the syllabus. The school runs an entrepreneurship programme for those secondary school students who choose to apply and are selected to form a specific class of their own. Every year, the school provides students with various after-school activities, such as sports, crafts, and cookery clubs. In recent years, the school has been able to offer an English-speaking international club hosted by an assistant teacher from abroad. Tänään Kirkonkylän koulu vastasi #kokosuomitanssii haasteeseen! Hienosti menee meidän 8lk. tettiläisillä!